There was never a lighthouse erected here. 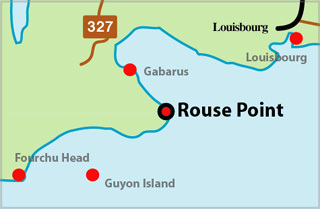 However due to the frequent summer fogs in this area, fishermen campaigned for a horn on Rouse Point. A tiny wooden building with an electric light on the seaward end of the roof was erected and a small electronic horn installed besides this building.